James Paxton is one of the most talented Left-Handed pitching prospects currently in the Minor Leagues. However, partially because he went through trouble entering the MLB Draft a few years ago, Paxton seems to be underrated be most of the baseball world. There is a decent chance that Paxton will make his MLB debut in Seattle before the All-Star Break, so he should have a chance to get some of the attention he deserves in 2012. The Mariners are lucky to have Paxton, whether they use him as a trading piece or they decide to keep him. James Paxton has the talent to become a #3 starter in the majors and it won’t be long before the baseball world is much more aware of this. Rob Bland (Intern Candidate for MLB Reports): The MLB Home Run Derby is one of the greatest events in comparison to the All-Star games of any sport. Fans flock in droves to watch the event, hoping to catch an amazing feat such as Josh Hamilton hitting 28 in the first round in 2008, only to come in 2nd place, and Bobby Abreu hitting 41 total home runs on his way to winning the title in 2005. 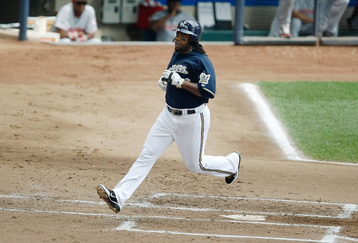 When the teams were announced, the fans booed both Prince Fielder and Rickie Weeks. Fielder was chastised for his selection of Weeks, as most casual fans were not aware of the pure power that he possesses. Weeks was chosen over Justin Upton, who would have been great in front of his Arizona hometown crowd. 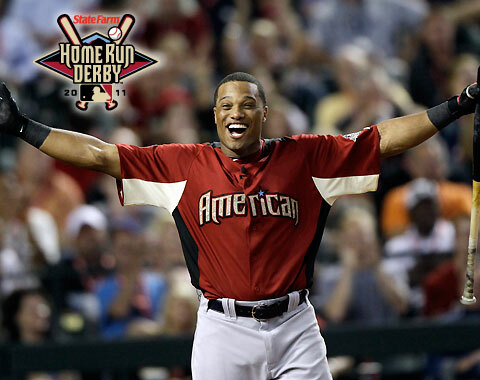 Early on this Derby lacked excitement, save for Robinson Cano’s first round, in which he had his father, former major leaguer, Jose Cano, pitching to him. Cano blasted a number of balls deep into the right center field bleachers, his longest being 472 ft. Jose Bautista was a bit of a disappointment, smashing only 4 home runs and ended up being eliminated in the first round of the derby. 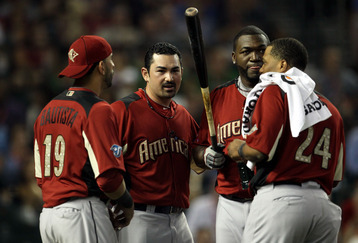 Other disappointments included the aforementioned Rickie Weeks and Matt Kemp, who hit 3 and 2 home runs, respectively. There was some excitement at the end, as both David Ortiz and Fielder hit 5 home runs a piece to tie Matt Holliday, forcing a 3-player swing-off for 3rd and 4th place. In this swing-off, each player received 5 swings in which to hit as many home runs as possible. Holliday led off with 5, Ortiz hit 4, and Fielder hit a perfect 5, two of which were mammoth shots. The second round started off with Ortiz, and he began to show his age. Ortiz was likely tired after the first round plus enduring the sudden death swing-off. Ortiz hit only 4 home runs in the second round, and his average distance was 426 ft. Then came the Robinson Cano Show again. Cano launched 12 home runs in the second round, averaging 436 ft. His swing was picture perfect, and it seemed as though any time he didn’t hit a home run, his dad would be upset with him. Robinson’s dad knows his son’s strengths, and was confident he could hit that many. That is likely why Cano was named Robinson by his father, after the late and great Jackie Robinson. Gonzalez was also able to put on a show in the second round, consistently pounding the ball 430+ft. He put on a display, hitting the ball to the opposite field, and straightaway center field on his way to finishing with 11 in the round, and 20 total, tying him with Cano. Fielder was up next, and aside from his first swing, that he hit 474 ft, he was not able to do much else. He finished with 4 in the round, 9 in total. So, it came down to the Yankees and Red Sox again. Cano and Gonzalez square off in the finals. Gonzalez immediately impressed, hitting 8 home runs in his first 3 outs. He cooled off and finished with 11 in the finals. With the most impressive rounds of the night, Cano hit 10 in his first 16 swings, needing only 1 more to tie Gonzalez. The crowd erupted as he hit a home run over 470 ft to tie it up. The very next swing was the one that did it, as he hit it out to right center field. Gonzalez had a record 11 home runs in the last round, and Cano was clutch in beating that. What started off as a slow, uneventful night, wound up being a compelling night of watching the Yankees battle the Red Sox in a pure power slugfest. Robinson and his dad embracing by the mound. The American League beating the National League. 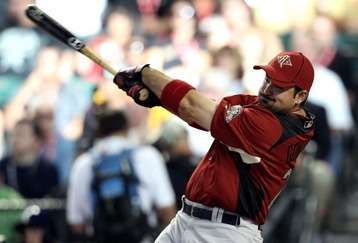 All in all, this year’s edition of the Home Run Derby was nothing short of spectacular. In a game showcasing most of baseball’s brightest shining up and coming stars, there were several players who stood out from the pack. Although Bryce Harper (WAS) stole the spotlight in both the pre-game and post-game festivities, he did not shine quite as bright during the game. He was 0 for 4 with 2 strikeouts and 2 ground outs to first. One of which was hit fairly hard but a nice play by Yonder Alonso got the out. Aside from two big innings, a 4-run 6th inning by the World Team hitters off of Drew Pomeranz, and a 3-run 8th inning off of Kelvin Herrera by Team USA, this was a game largely dominated by flame-throwing pitchers. For the US Team, my standout hitters were Jason Kipnis, (CLE) who led off the bottom of the 1st with a home run over the right-centre field wall, and Grant Green (OAK). Green crushed a double off the top of the wall in straight-away center that I thought would have been gone in any other park. He also stroked another double, going 2 for 2 with 2 doubles, a run scored and RBI on his way to earning MVP of the game. On the mound, I was blown away by Matt Moore, Tampa Bay’s mega pitching prospect. He threw 11 pitches, 9 of which were strikes. His fastball was clocked consistently between 94 and 98 mph, and he was also throwing a devastating slider at 86 mph. Phillies prospect Jared Cosart was also very impressive. 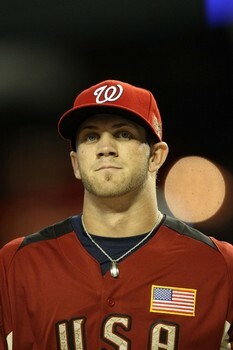 He racked up 2 strikeouts and a fly out on 10 pitches; 8 strikes. Sitting at 96 with the heater, he also displayed a plus change-up. Jose Altuve (HOU) is a guy that doesn’t get much credit, because he stands at about 5’6”. However, the Venezuelan native has hit everywhere he has played. He was 2 for 3 with a single and a double, and I came away impressed with the diminutive infielder. Jurickson Profar (TEX) may have been the youngest player there, but he was not overmatched, as he stroked a triple off Drew Pomeranz and displayed his impressive speed. On the bump, Canadian James Paxton stood out to me. The University of Kentucky product threw 6 pitches; all fastballs, and induced 3 quick outs. He was between 94 and 96 and showed better control than I remember the last time I saw him. Henderson Alvarez (TOR) was also impressive, with a fastball that topped out at 98 mph, and getting Harper to ground out to first on a 95 mph sinker. The US team jumped out to an early lead thanks to the leadoff home run by Kipnis in the first, and an RBI fielder’s choice by Wil Myers (KC) in the 2nd inning. 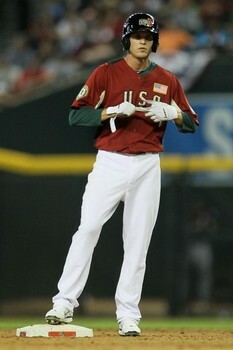 Team USA then made it 3-0 in the 5th on Green’s first double, which scored Gary Brown after he singled and stole second. In the top of the 6th, Drew Pomeranz (CLE) struggled, and gave up 4 runs. Alfredo Silverio (LAD) homered to left, scoring Dayan Viciedo (CWS) who had singled 2 batters prior. A walk to Chih-Hisen Chiang (BOS) and a double to Sebastian Valle (PHI) spelled the end of the night for Pomeranz. With the score knotted at 3, Profar then hit his triple off Kyle Gibson (MIN), scoring Valle in the process. Green led off the 8th with a double, and Tim Beckham (TB) drove him in with a double of his own to tie the game at 4. After an Austin Romine (NYY) single and a Nolan Arenado (COL) double to right field, the damage was done, and the US had a 6-4 lead. 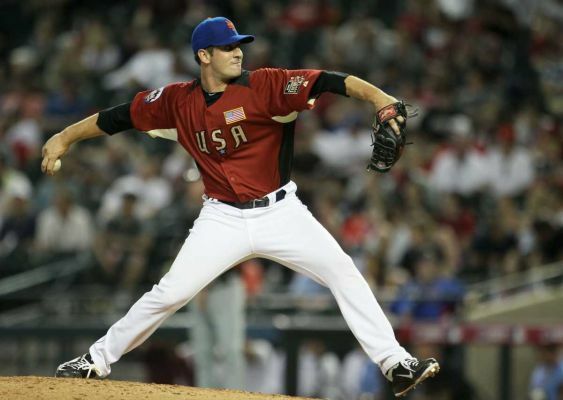 Jacob Turner (DET) and Matt Harvey (NYM) split duties to close out the game for the US Team. The US has now taken a 7-6 lead in the all-time series. A good number of these players will be on Major League rosters by season’s end, so be sure to check in on the minor league squads of your favorite teams for updates. a-Doubled for Rosario, W in the 6th. b-Tripled for Lee in the 6th. c-Flied out for Marte in the 6th. d-Popped out for Viciedo in the 7th. 2B: Altuve (1, Skaggs), Valle (1, Pomeranz). HR: Silverio (1, 6th inning off Pomeranz, 1 on, 2 out). TB: Marte; Altuve 3; Schoop; Viciedo; Silverio 4; Valle 2; Profar 3. RBI: Silverio 2 (2), Valle (1), Profar (1). 2-out RBI: Silverio 2; Valle; Profar. Runners left in scoring position, 2 out: Liddi; Viciedo; Fuentes. CS: Schoop (1, 2nd base by Gibson/Romine). PO: Schoop (1st base by Gibson). a-Doubled for Kipnis in the 5th. b-Struck out for Machado in the 5th. 2B: Green 2 (2, Perez, M, Herrera), Beckham (1, Herrera), Arenado (1, Herrera). HR: Kipnis (1, 1st inning off Teheran, 0 on, 0 out). TB: Kipnis 4; Green 4; Beckham 2; Mesoraco; Romine 2; Middlebrooks; Arenado 2; Brown, G.
RBI: Kipnis (1), Myers (1), Green (1), Beckham (1), Romine (1), Arenado (1). 2-out RBI: Green; Romine; Arenado. Runners left in scoring position, 2 out: Beckham; Darnell. SB: Brown, G (1, 2nd base off Perez, M/Rosario, W). Pickoffs: Gibson (Schoop at 1st base). HBP: Mesoraco (by Martinez, C). Pitches-strikes: Teheran 19-13, Hendriks 18-10, Paxton 6-4, Martinez, C 11-6, Perez, M 23-11, Alvarez, H 11-6, Vizcaino 6-5, Herrera 23-14, Marinez 11-8, Skaggs 17-11, Peacock 9-7, Miller, S 20-12, Moore 11-9, Thornburg 10-7, Pomeranz 23-14, Gibson 16-11, Cosart 10-8, Turner 9-6, Harvey, M 3-1. Groundouts-flyouts: Teheran 1-1, Hendriks 2-1, Paxton 2-1, Martinez, C 1-0, Perez, M 1-0, Alvarez, H 2-1, Vizcaino 2-0, Herrera 0-1, Marinez 0-0, Skaggs 1-1, Peacock 1-0, Miller, S 2-0, Moore 2-0, Thornburg 2-1, Pomeranz 0-0, Gibson 0-2, Cosart 0-1, Turner 0-1, Harvey, M 1-0. Batters faced: Teheran 4, Hendriks 5, Paxton 3, Martinez, C 3, Perez, M 5, Alvarez, H 4, Vizcaino 3, Herrera 6, Marinez 1, Skaggs 5, Peacock 3, Miller, S 5, Moore 3, Thornburg 4, Pomeranz 6, Gibson 5, Cosart 3, Turner 2, Harvey, M 1. Inherited runners-scored: Marinez 1-0, Gibson 1-1. Umpires: HP: Ben May. 1B: Will Little. 2B: Jimmy Volpi. 3B: Scott Mahoney. Weather: 74 degrees, roof closed. Please e-mail us at: MLBreports@gmail.com with any questions and feedback. You can follow us on Twitter and become a fan on Facebook . To subscribe to our website and have the daily Reports sent directly to your inbox, click here and follow the link at the top of our homepage.